It’s nearly time to go back to school and uni, which means summer is nearly over. When I was younger one of my favourite things to do in summer was to go shopping for my new uniform and school essentials. Now that I’m at university it’s even more exciting, there’s no uniform and I am so ready to go back with a new wardrobe – here are some of my favourite pieces. 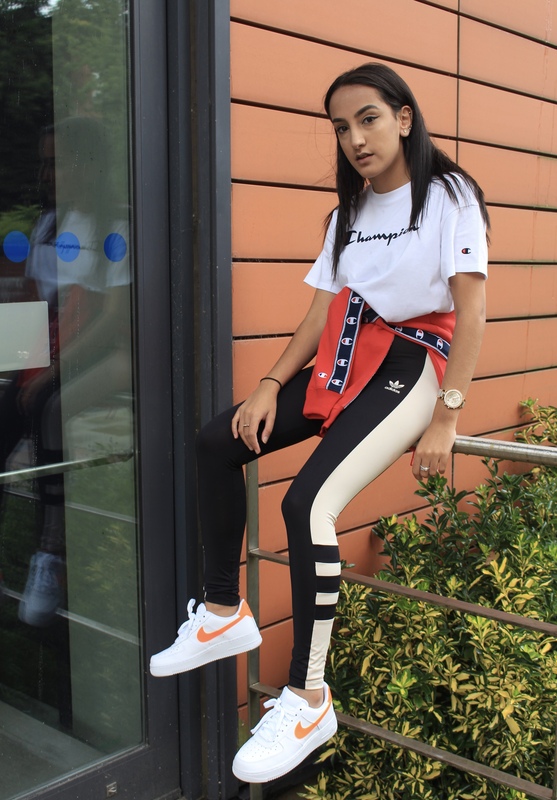 Champion Crop Script T-Shirt – JD Sports. As you all know Champion has been a reborn trend recently. I love the style of this t-shirt I love the vintage/urban vibe Champion gives off with it’s clothing. This white cropped t-shirt is so easy to wear whether that’s with joggers or a pair of leggings. 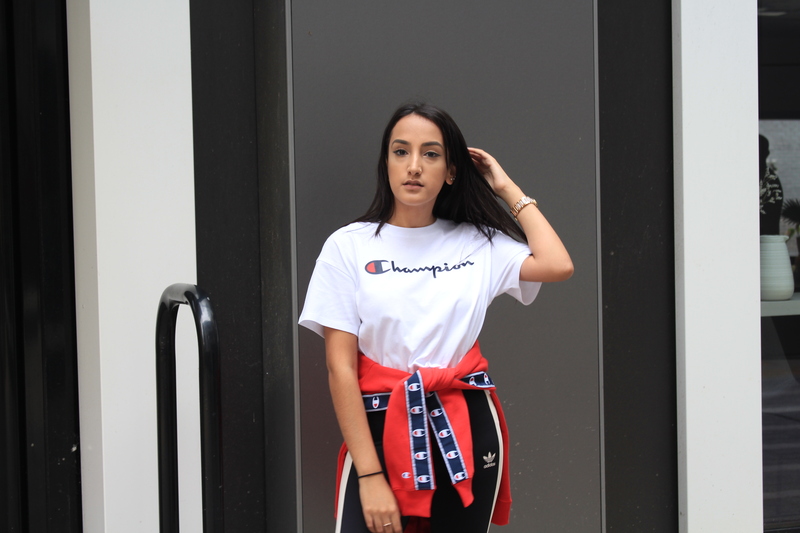 Even with a pair of trousers or mom jeans which I also think would work really good together (see how I styled a Champion t-shirt with trousers here). It’s the perfect cropped length and not all see through. Champion Tape Overhead Boyfriend Hoodie – JD Sports. Carrying on with my love for Champion as well as bright colours, let’s talk about this hoodie. I mean it speaks for itself. If you want something bright but trendy this is what you need in your wardrobe. I love how this looks on, the tape running down the arms is such an aesthetic touch and I’m not going to lie to you this is the comfiest hoodie I own. I want to live in it honestly. For going back to uni I know what I’m going to be living in. Adidas Originals Panel Colour Block Leggings – JD Sports. I love Adidas, as you all already know. It’s one of my favourite brands. I love the simplicity and comfort Adidas as a brand nail this every time. I live in my 3 stripe black Adidas leggings so I know what are going to be my new favourite. These are a slightly differently material which I don’t mind because they’re extra stretchy and so comfortable for them chill days at uni where you just want something loungy to wear. I love the colour way, they’re not white but an off white shade which is neutral and makes it easier to style them with other items. 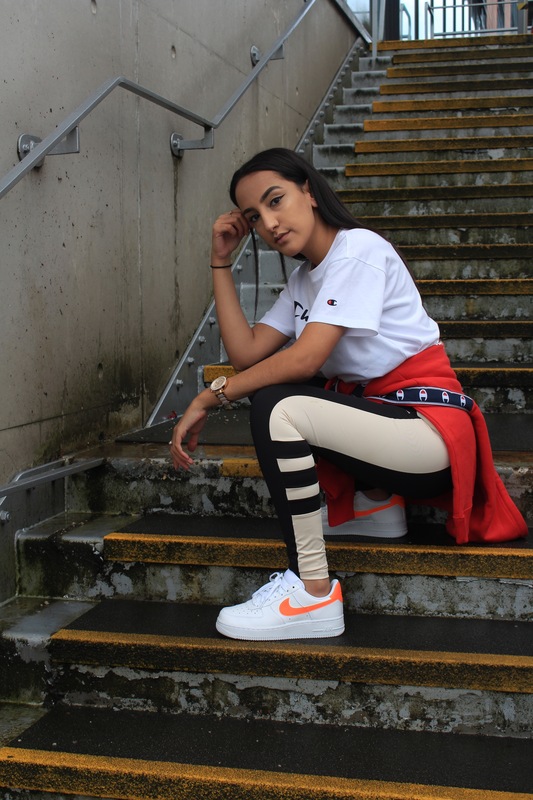 Nike Air Force 1 ’07 LV8 Women’s – JD Sports. My feet being comfy is an essential, as well as my crep game being strong. What better way to turn up to uni, in my fresh exclusive Air Force 1s. I mean how pretty are they? YES you got it right they are so dope. The orange is such a nice touch, rather than the all white ones I feel as though these have that rarity to them. I love how they look on and Air Force ones are so easy to wear. Whether that’s with some skinny jeans, joggers or even a dress. 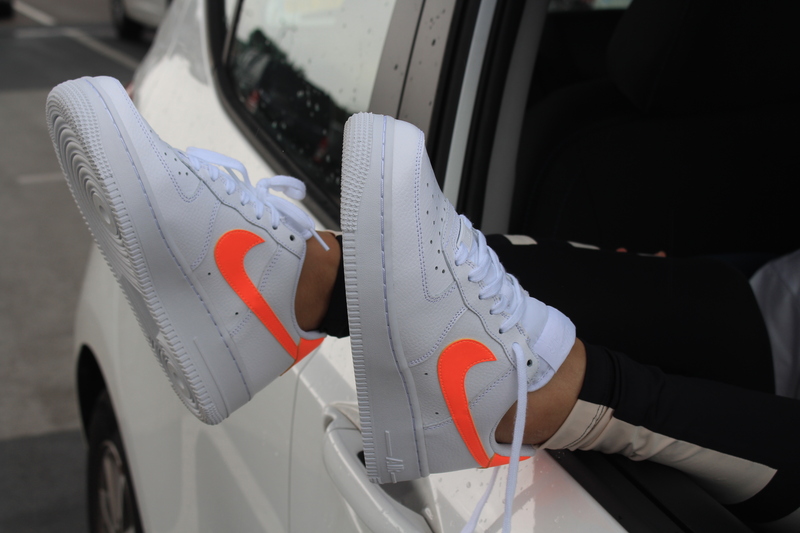 Air Force ones do the most, they are comfy and look good with almost everything. That’s all you ever need in a pair of trainers. 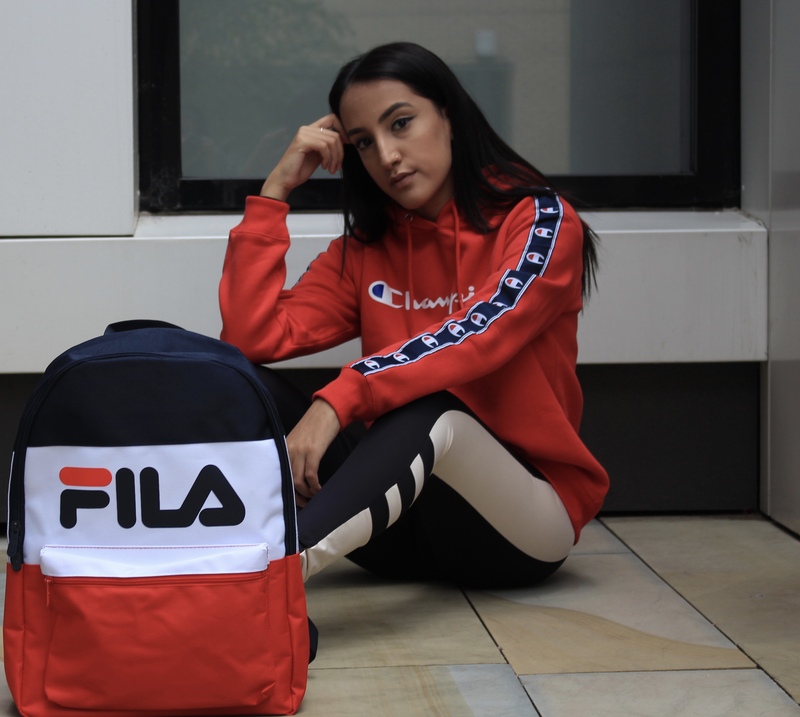 Fila Vivian Backpack – JD Sports. Name an bag Kiran can’t live without?…Yes a backpack. I love backpacks so much, I’ve always had one whether that was in high school up until college and I shall continue to do so. So I present to you my new BFF my Fila backpack. I mean everything about this backpack is so cool, I love the blue, red and white colour way. Theses colours are SO in at the minute and I’m here for this trend. Giving me Tommy Hilfiger vibes and I’m okay with that. It’s the perfect size, for my laptop and I bet I could fit so much more other things in. It’s not too big and not too small, just the perfect size for essentials. It’s perfect if you need a new school bag, trendy but wearable. Are you excited to be going back to school, college or either university? Comment below.